Posted on February 10, 2016 by Philip O'Hanlon. Lori Lieberman was not the only musician that stopped in this year at CES to pay us a visit. Graham Nash also dropped in with Stereophile’s Jon Iverson and Jason Serinus and let us play a few tracks off of his upcoming album on our system. Jon told me afterwards that Nash had been quite worried that he might not like the sound he heard and would have to explain what was wrong. He thinks that many of the high speaker designs sound “honky” and color the music too much. He wanted to hear what he recorded in the Studio and it would be a bonus if the speakers delivered more. 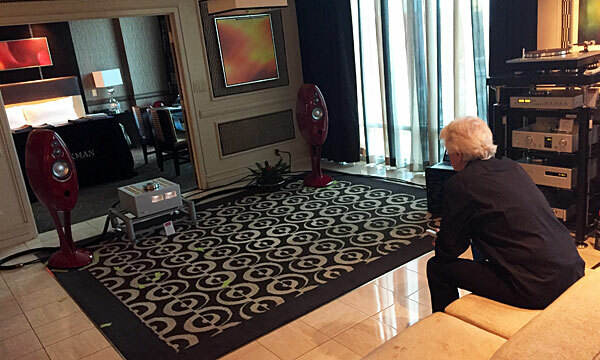 Graham Nash listening in OAHN room. Photo credit: Jon Iverson, Stereophile. After all the pleasantries were exchanged, I initially played Christy Moore’s Pink Floyd cover of “Shine On You Crazy Diamond” to give him an idea of what a regular CD 16-44.1 recording sounded like on the system. Then we connected up Graham’s personal notebook with a USB cable to the Luxman D-08u Player and played a few cuts from Graham’s new album This Path Tonight to be released on April 15th, 2016. This is Nash’s first album of new music in fourteen years. He was thrilled (jumping out of the seat with expletives) with what he heard. He said that it sounded like the studio and delivered the emotion that he was looking for. We used the Luxman 900 series electronics—which are truly stellar—driving the new Vivid Audio B1 Decade. Lots of punch, but also capable of delivering a tonally rich mid-range and silky highs. The new album sounds a little rawer and more mature than earlier albums. It’s a little more adventurous with layered vocals on some of the tracks. I plan on buying this on vinyl, as Graham went to a lot trouble to get a really nice, natural sound, brimming with emotion. Read full article at stereophile.com. This entry was posted in Press and tagged CES, Graham Nash, Jon Iverson, Stereophile.